The Tega V2 Windows tablet pc (slate pc) is now available via the Tega website. The purchase price is $799 USD. 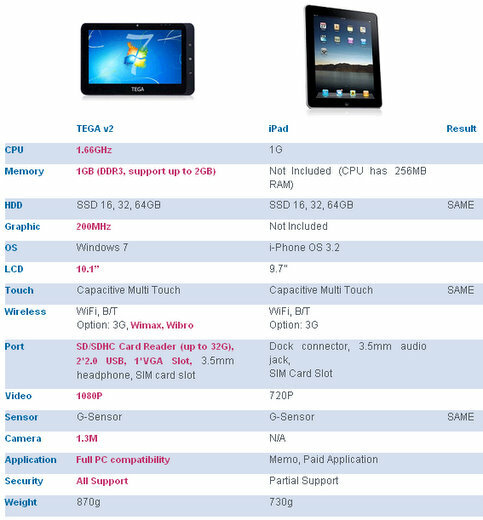 The Tega V2 is slightly larger than the iPad, but the starting price is nearly $300 more than the iPad, and with a much worse reputation. The Tega V2 has managed to operate the full Windows 7 OS on a tablet. However, is this something that people even want to deal with? The typical Windows updates, viruses, sluggish performance, etc… all the things that turn people off from Windows OS.